One in seven Americans age 71 and older has some type of dementia, NIH-funded study estimates - National Institute on Aging. Dementia and Alzheimer’s are progressive diseases that are hard to live with, and sometimes even harder to watch a loved one live with. 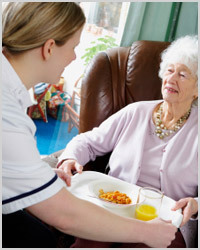 Affordable Home Care has a cognitive intervention program called SMART. Cognitive intervention is a technique used by psychologists and neuropsychologists to help with cognitive deficiencies. SMART was designed to help individuals with Alzheimer’s and dementia. By exercising your brain with a program that requires our brains to work in new and novel ways, some doctors now believe we can slow the progression of diseases like Alzheimer’s and Dementia and maintain our level of cognitive functioning longer. Through our SMART program, our exceptional caregivers will utilize techniques such as positive reinforcement, redirection, behavioral triggers & control, while coaching your loved one through mental exercises that could extend cognitive ability. Affordable Home Care is the only company with the SMART cognitive intervention program.